Cradle Mountain Lodge is a unique wilderness experience, set right on the edge of the spectacular World Heritage-listed Cradle Mountain-Lake St. Clair National Park, just 2 hours drive from Launceston and 1.25 hours from Devonport. This superb escape showcases the best Tasmania has to offer, with warm hospitality, sensational local food and wine, breathtaking scenery and magnificent wilderness surrounds. Around the Lodge, there are more than 20 walking trails that suit every fitness level. Discover animal and plant varieties found nowhere else on earth. You can trek mountains, take to trails on horseback, mountain bike or learn to fly-fish - just some of the many activities on offer. 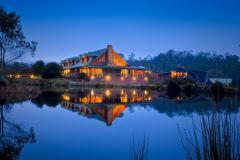 Set discreetly within this wilderness setting, there are 90 private timber cabins, offering 4 grades of accommodation. Each provides every comfort you could need, some with spa bath.